An incredible variety of trains and motive power is what makes railfanning this stretch of the former New York Central �Water Level Route� so reqarding! Join us for over 2 years of coverage and see our best catches in this area that we like to call �The Heart of the Mohawk Valley�! Award Value: 120 Points Earn points for free DVDs. Signup free. mySP7377 (San Diego CA US) on 2017-12-09 14:46:28. Excellent DVD, well photographed, interesting and informative narrations. There's a lot of trains seen in this DVD with some very interesting lash ups seen through out the show, heritage units from both the UP & NS are seen along with a lot of pool power and run through power. Action is non stop with just about every type of train seen from intermodal and stack trains to unit tank trains, manifest freights,ect to many to mention. A "Must Have" DVD for anybody how enjoy's non stop heavy main line action that's well photographed. Curt (Santa Barbara CA US) on 2017-06-24 08:23:01. 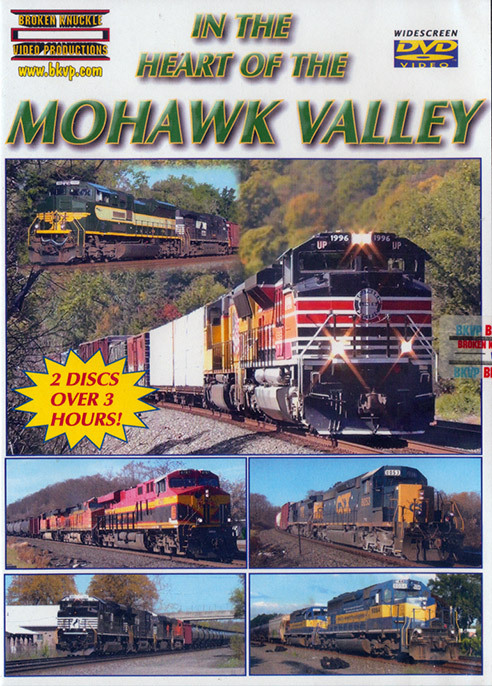 Another nice release from BK in their series on the Mohawk Valley. Filmed over a 2 year period, this dvd features a great variety of engine lash-up's, with plenty of foreign and leased power. Also includes a number of Norfolk Southern Heritage engines on the point. The videography is high-quality, with an appropriate amount of narration. Highly recommended and a good bargain for over 3 hours of action.